however after this conversion, it's a completely different story( and phono pre-amp ). 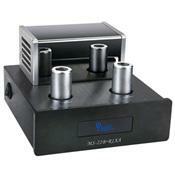 This is good little phono preamp for the money. Actually, quite exceptional for them money. Out of the box, the mids were somehat closed in and veiled, however the highs were quite good and the low end plentiful and full, if not a little loose. After about 25 hours, the unit and tubes begin to open up and the stage becomes both wider and deeper. Much of the midband veil begins to disappear. The Yaqin ms-22b definately provides for a tube like warmth and will introduce you to the "darkside" through solid state amplification. I wouldn't call this preamp highly transparent or detailed, but it is warm and full bodied in presentation. Now, this is with the stock cheap tubes. As with all valve gear, the sound can be significantly improved through the installation of high quality tubes. I have on order a matched pair of 1950's vintage NOS RCA black plate tubes which will undoubtedly improve the sound across all frequencies, and will likely remove the midband issues. I will report back in one month's time in regards to the Yaqin with the vintage RCA tubes. However, right out of the box, likely impossible to beat for the money.